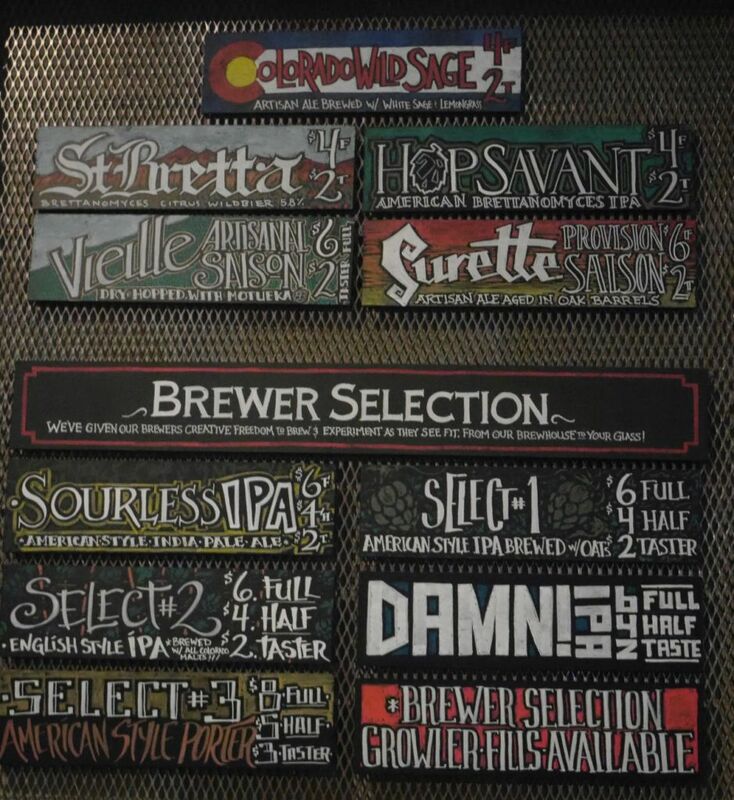 I recently made a short weekend trip to Denver and during that time I visited some breweries I missed out on the last time. 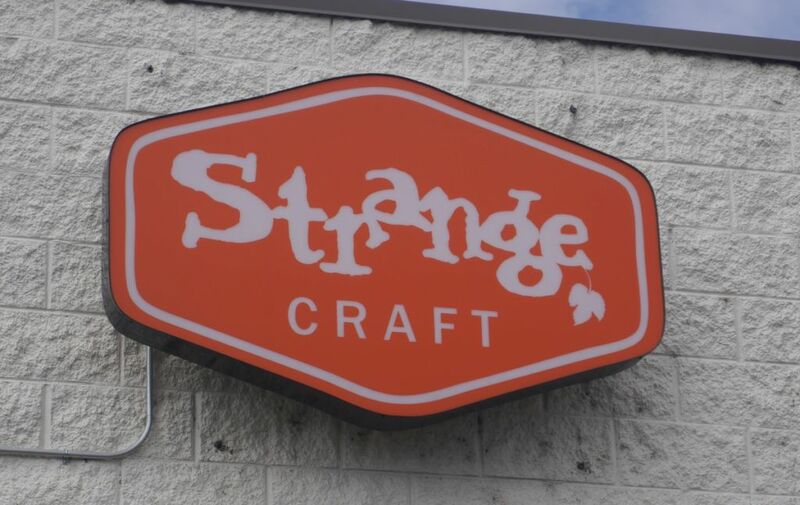 I heard a lot of great things about Crooked Stave and to a lesser extent TRVE, and visited Strange because someone I was visiting recommended them. 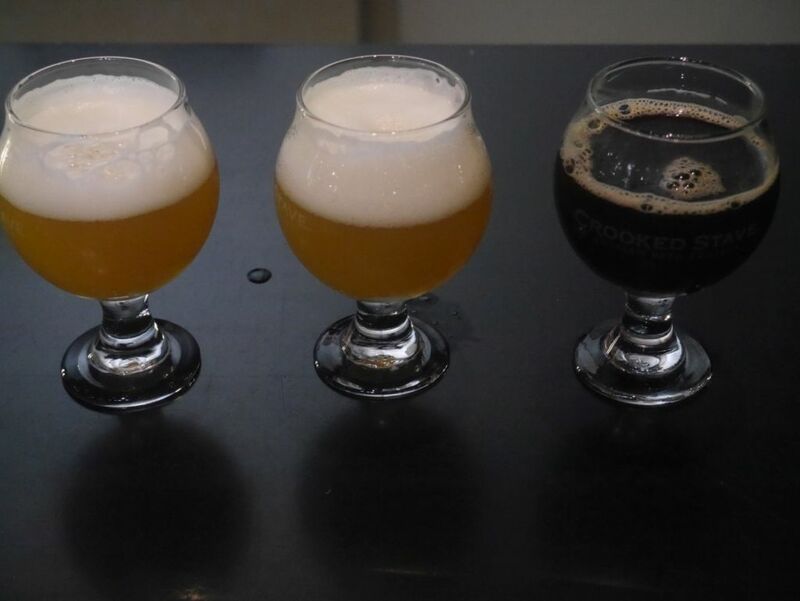 Crooked Stave has been brewing farmhouse ales and sours as their main focus for a while. Sometime more recently, they started experimenting with IPAs and have come up with some fantastic cloudy/juicy IPAs. 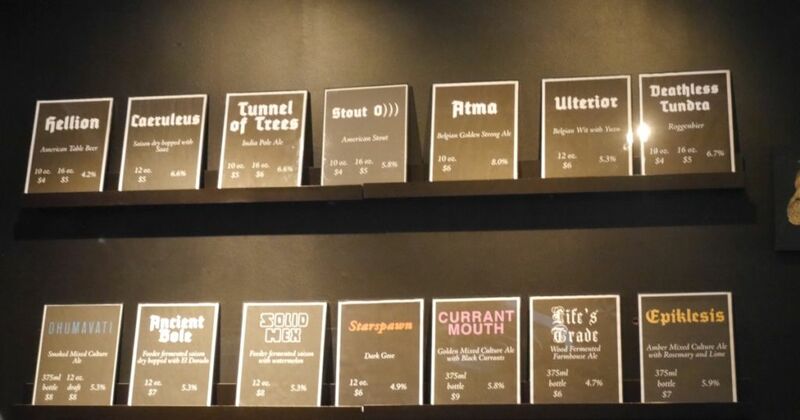 While the taster price for their sours initially seems ridiculous (some are $4 or $5 for a 5oz taster) keep in mind that those same beers are $14 for a 375ml bottle, so the price on tap is not much worse per ounce than a bottle. 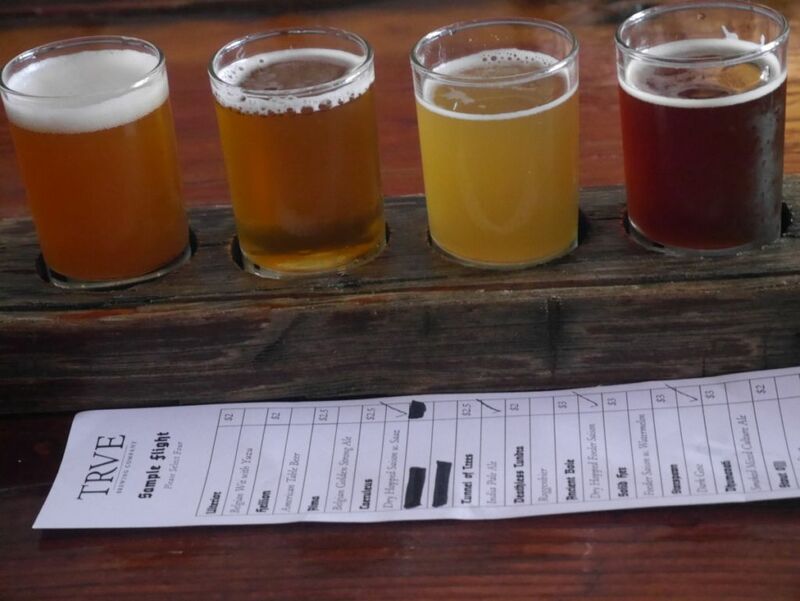 Crooked Stave is located in the back of a small shopping complex that was converted from an old abandoned brick building. When you first pull into the dirt parking lot in front, which is almost always full, you may question whether you should be there at all. It looks quite sketchy. Once inside, you will see a number of small shops and restaurants and Crooked Stave’s tasting room is at the far back area. They don’t have an outward sign telling you where to go either, but once you are inside you will feel right at home in their tasting room setting. Tasters range from $2 to $5 depending on the style and I broke up my tasting into two sets of 3 and came home with a few bottles as well. I started with the Damn IPA which was cloudy and nicely carbonated with tons of citrus and ginger notes. The Sourless IPA was also quite tasty with lots of citrus and some mild herbal note and a bitter finish. Both were solid examples of the juicy IPA style. I got a taster of the porter for my husband before he went off to do other things but he didn’t care for it. I found it to be very delicious with lots of cherry notes that balance with bitter chocolate and some herbal hop notes. The beer was quite smooth and medium body. For sours I started with Origins, a Flanders Red style of sorts. It had a strong tart kick with some mild jam notes and hints of caramel and mild balsamic vinegar. 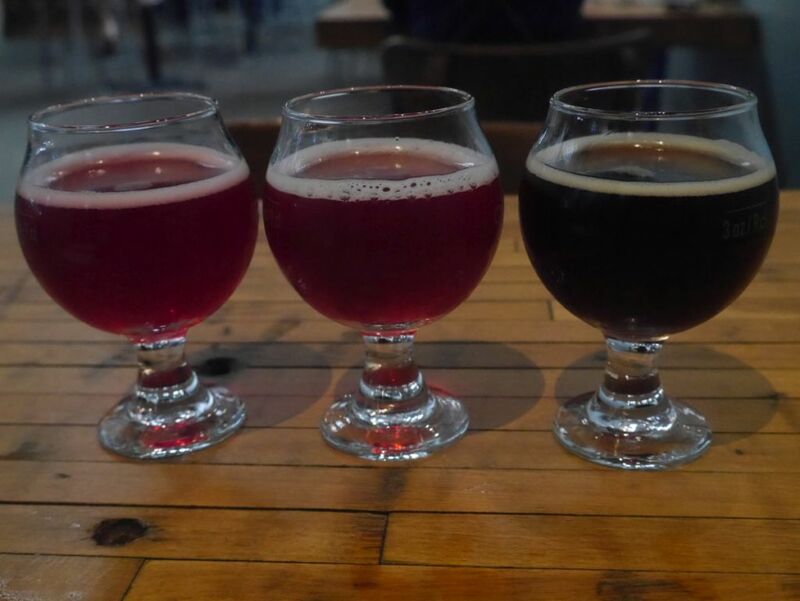 I went next to the two L’bretta beers one with raspberry and one with blueberry. I found the raspberry the clear winner with tons of jam character, strong fruit notes, and a nice tart acidic finish. The blueberry was a bit more subtle and less acidic. Flavors are so subtle that if you drink it right after the raspberry you might miss parts of it. Fantastic sours and now great juicy IPAs. 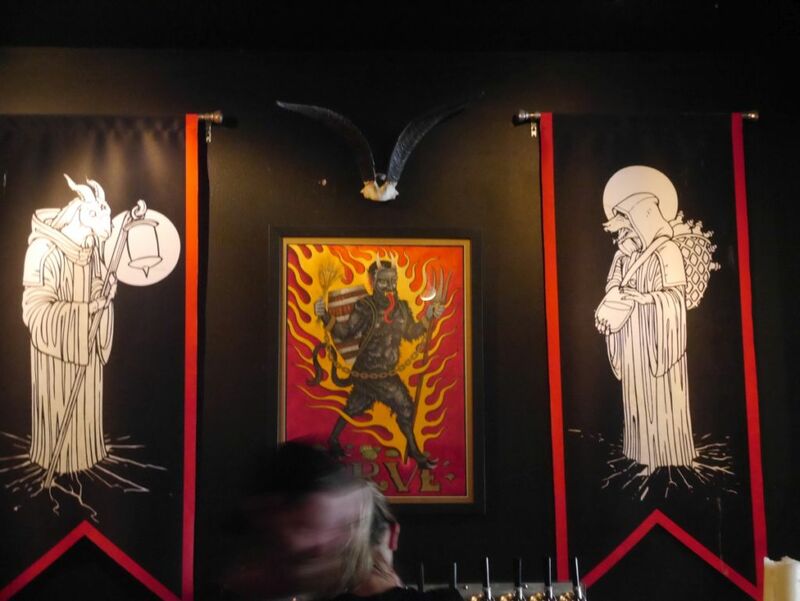 TRVE is a younger entry on the scene and has a heavy metal theme at their brewery with leanings towards satanic imagery. Thankfully the music isn’t blasting as loud as a typical metal head might prefer so you can still order beers and have a conversation without going deaf. I had a total of four tasters because while they were good I wasn’t craving more and my friends wanted something a bit more hoppy. The first beer I had was a hoppy saison called Caeruleus. It was nice and fruity with a good mix of spice and some mild hop kick. The aged saison was lightly tart with lots of lemon notes and a crisp finish. The IPA was smooth and balanced, mostly herbal hops, fairly average. The gose was a darker version of the style which added a nice caramel note to the typical lightly tart and lightly salty gose. I brought home a bottle of a currant sour from them so hopefully that is more impressive. While I enjoyed the beers I had, I don’t feel an urge to return to the brewery based on the beers available on tap. Visit for Belgian style beers and a collection that plays with different styles. Based on a recommendation from my friend we stopped for a flight at Strange Brewing, which consisted of six beers mostly stouts and IPAs. Stout was very true to style 5% stout. The cherry bomb stout added a little kick with cherry and peppers but nothing outstanding. The different IPAs were all fairly average with the exception of the grapefruit IPA which had a lot of great citrus character even though it didn’t taste like it had any added zest or juice. The astute reader may want to jump right to the comments section to note that Maine Beer Company is not in Portland Maine. 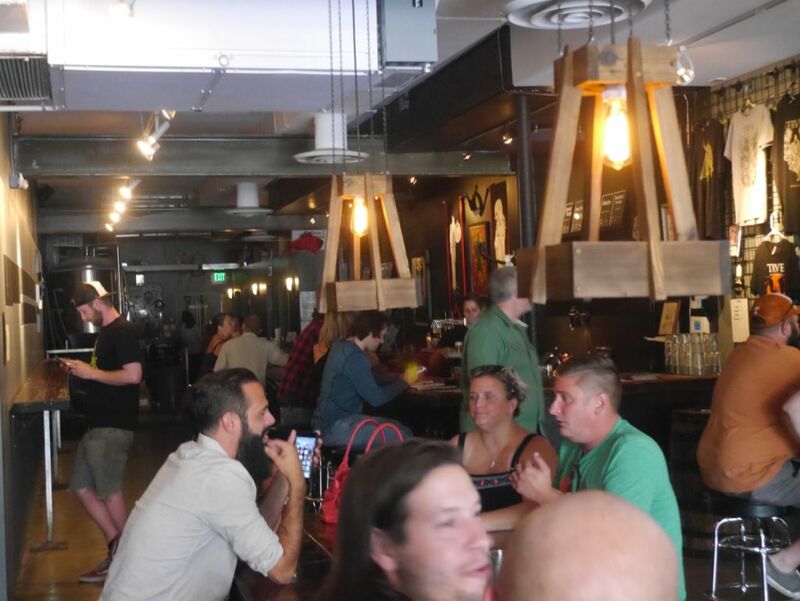 While this is true, the beers are widely enough available in Portland that a review of what I had at the tasting room can be useful for someone planning a trip out to Portland Maine. 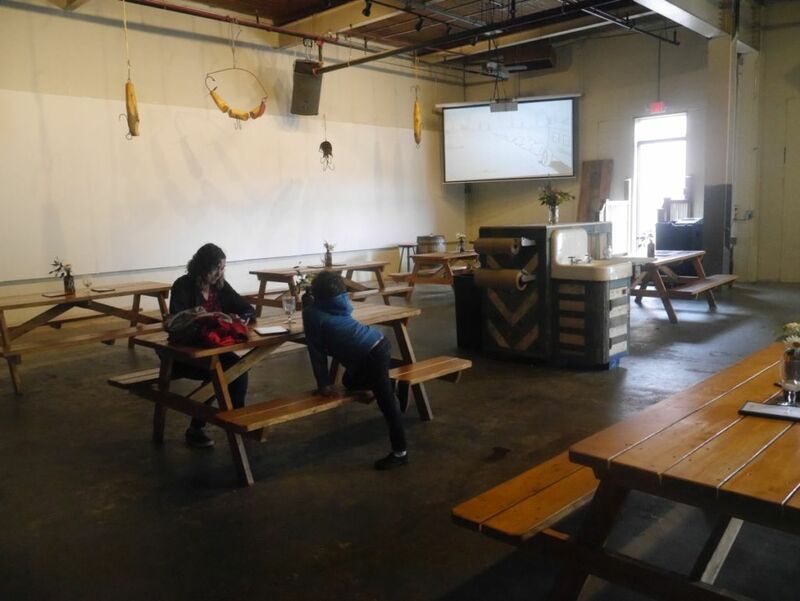 Oxbow is also not in Portland, the brewery itself is further north, but they have a tasting room available that you can visit where you can buy bottles and try tasters. Sadly, like many trips the number of breweries i could visit was limited by both time and the day of the week when I visited so certain other breweries were not an option either. 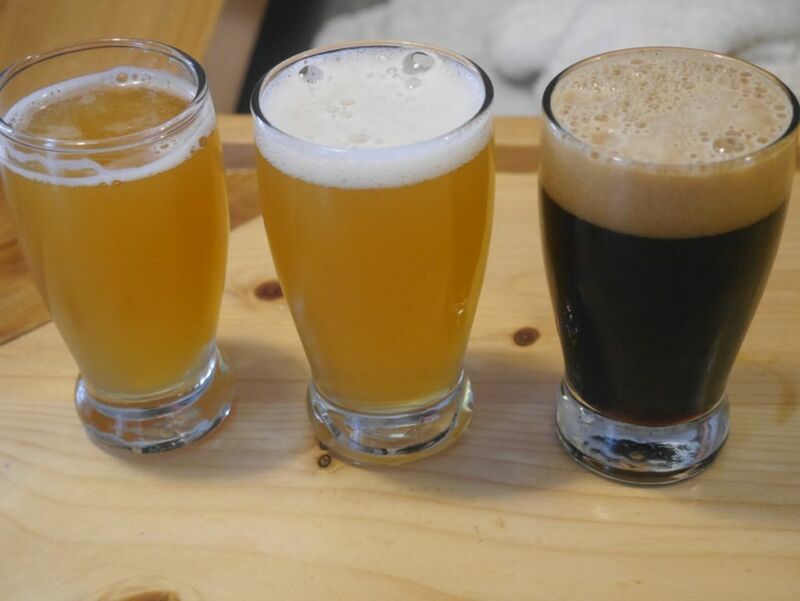 Oxbow has a tasting room in Portland Maine where they have a good number of beers on tap and offer flights. 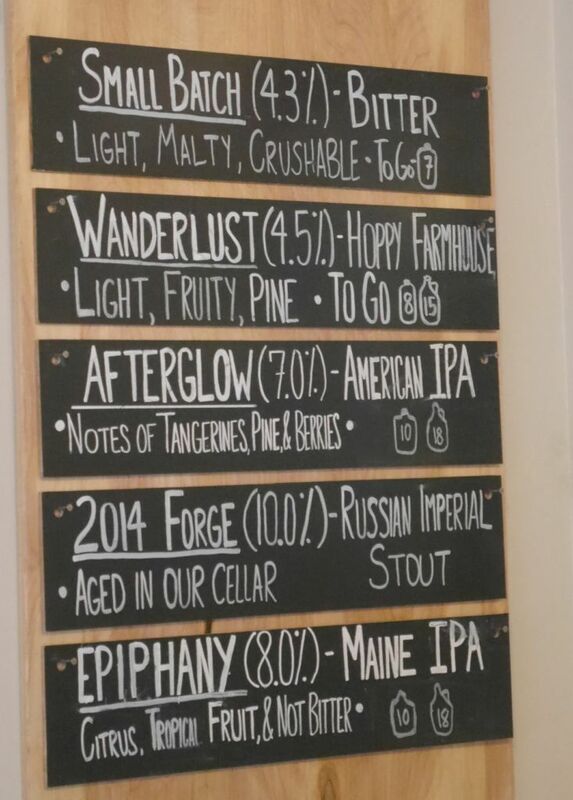 They also have some guest beers on tap and in bottles that you can drink while you are there. I stuck with the house beers. The basic farmhouse ale was earthy with a nice mix of fruit and funk and some mild hop flavor coming through. Both this and the Loretta are quite low alcohol and yet manage to deliver plenty of flavor. Loretta is also quite subtle but it has some tasty earthy hops, mild fruit notes, and a dry finish. Freestyle 37 is a tasty farmhouse pale that blends the earthy farmhouse malts with fruity hops quite nicely though you might want to skip this and the Domestic Farmhouse IPA if you don’t care for hops. Domestic Farmhouse IPA is a flagship of theirs and sadly wasn’t availble in bottles when I visited because it was delicious. The beer blended really nicely with the subtle earthy farmhouse malts and delicious juiciy hop character the area is known for. The Biere de Garde was quite complex with notes of dark fruit and caramel and some mild bitterness from the hops. 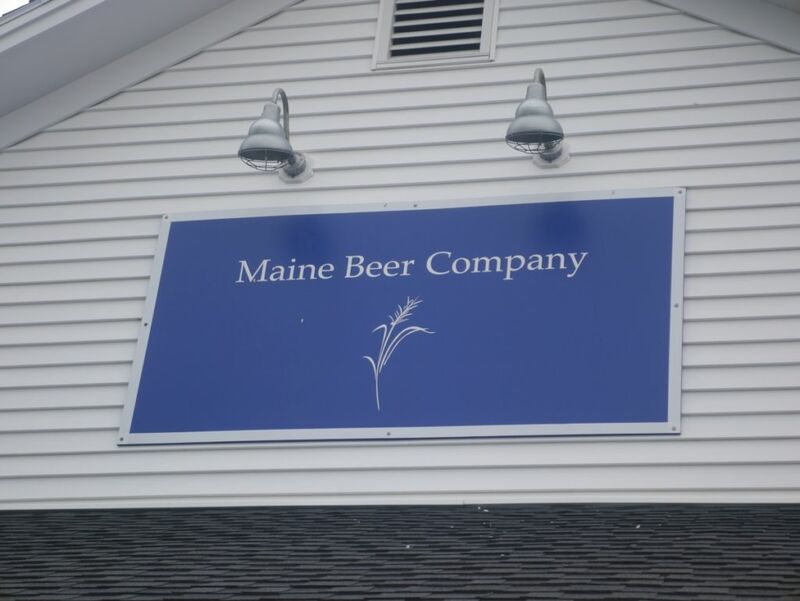 Though not in Portland Maine directly, it is a short 30 minute drive or less to Maine Beer Company where you can order flights, buy bottles, or do some full pours. I stuck to the hoppy options because they are most hyped for them. The Beer II Session IPA was quite nice for a session and not too bitter with lots of hop character. The Mo Pale was slightly stronger than the session and added on some fruit notes but was otherwise not drastically different than the session. Another One IPA was smooth and low on bitterness though I didn’t detect any specific hop flavors. Lunch was a little smoother and has a nice balance of malt character and citrus and resin hops. Lunch would fit right in with the various San Diego IPAs and is quite a tasty beer. I chose to not leave with any bottles, despite their high trade value, because I thought a few of San Diego’s IPA offerings are better and I prefer to only buy individual bottles of hoppy beers if they are quite exceptional especially on a trip where I brought back quite a bit of hoppy beer in cans. Though Maine Beer Company does brew a stout, it was not available on tap at the time so I am glad we stopped in Vermont and picked up a bottle to taste. It was quite a nice stout with notes of vanilla, tons of roast, and mild smoke character. 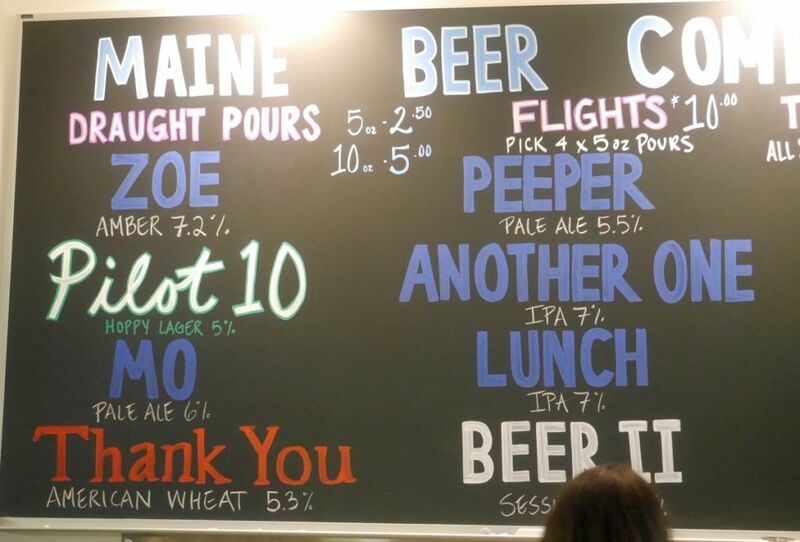 If you are going out to Maine Beerc Company, look for Lunch and Dinner, their two most popular IPAs. If you don’t value the tasting room experience you can usually find their beers around Portland Maine quite easily to bring back with you. 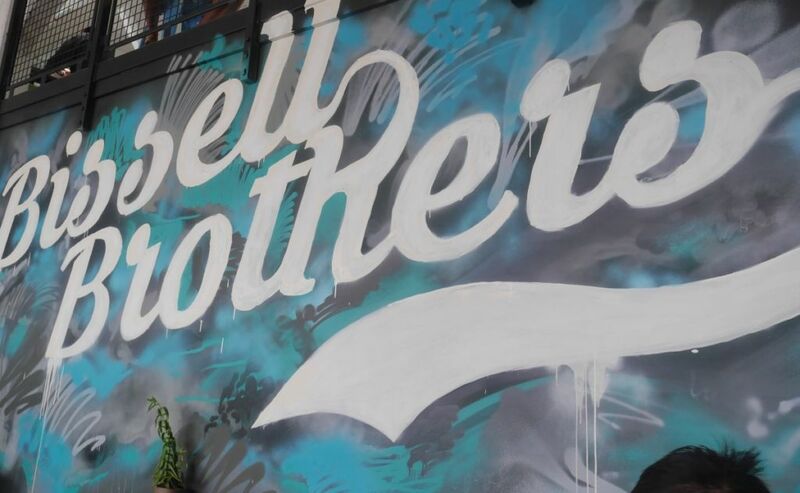 I only tried two beers at Bissel Brothers because they were not selling any cans. I found out the hard way that they don’t sell cans on Sundays. The two beers I had were quite good and both made me wish I could buy a few cans. The Rye Pale was super juicy and cloudy with some herbal notes, very impressive. The IPA I tried, their flagship, was juicy with tons of grapefruit and some mild spice. 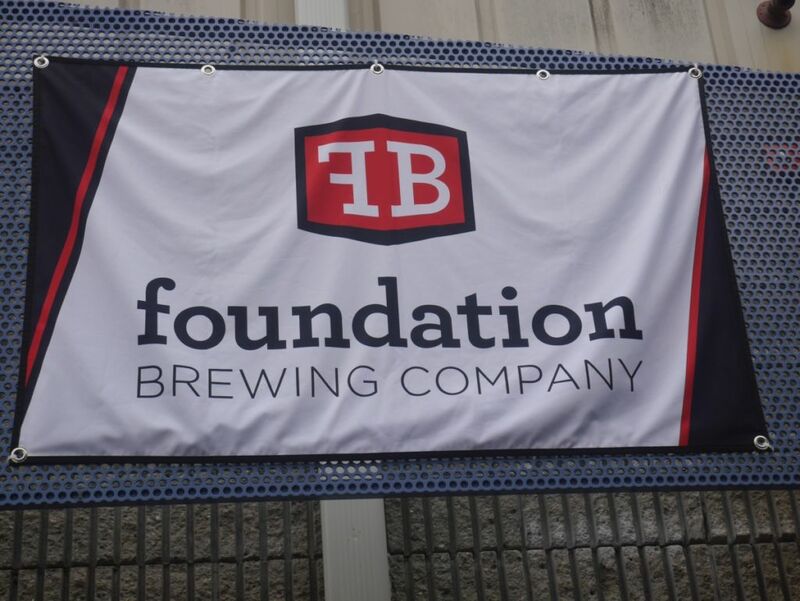 I thought overall the beers at Bissel Brothers and Foundation were more impressive than Maine Beer Company. The tasting room is also quite noisy and tends to get loud even with a small number of people. 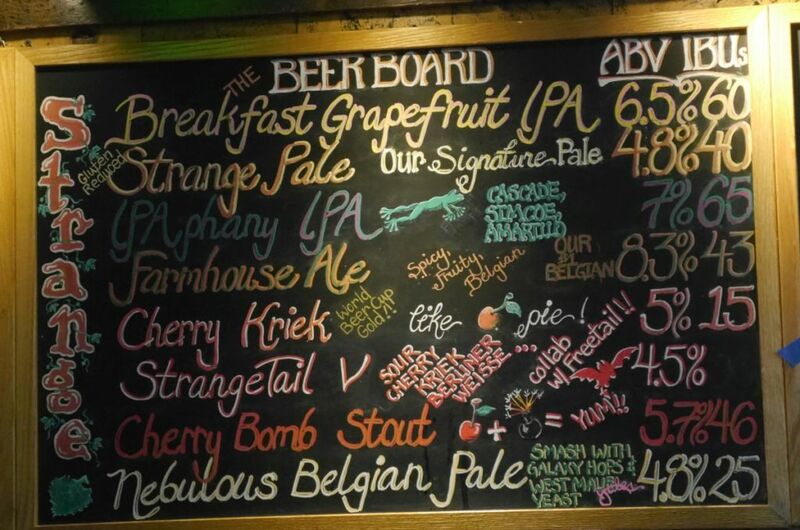 Come to Bissel Brothers for IPAs and to try the signature North East style juicy IPAs. I almost didn’t visit Foundation but since the tap list was limited at Bissel Brothers I wanted to hit another brewery. I tried their Afterglow IPA, Epiphany Double IPA, and imperial stout. The Afterglow was smooth and juicy and not too bitter with some nice orange notes, like drinking orange juice. Epiphany was extra juicy and fruity with lots of citrus character and super smooth, also not very bitter. I thought Epiphany was the best beer I had on tap for the trip and was up there with the Trillium Double IPA cans I brought back with me. They also had an imperial stout on tap, a first for the area, and it was fruity with notes of bitter coffee and a bitter finish, quite a nice stout. My husband ended up having two tasters worth because he liked it so much. The tasting room at Foundation was a bit small but had a good sized outdoor area open where you could enjoy the beers. Some locals I saw indicated that there is usually more room inside for you to drink. Foundation is also in an area where you will find a bunch of other breweries including Allagash, which happened to be closed the day I was in town. 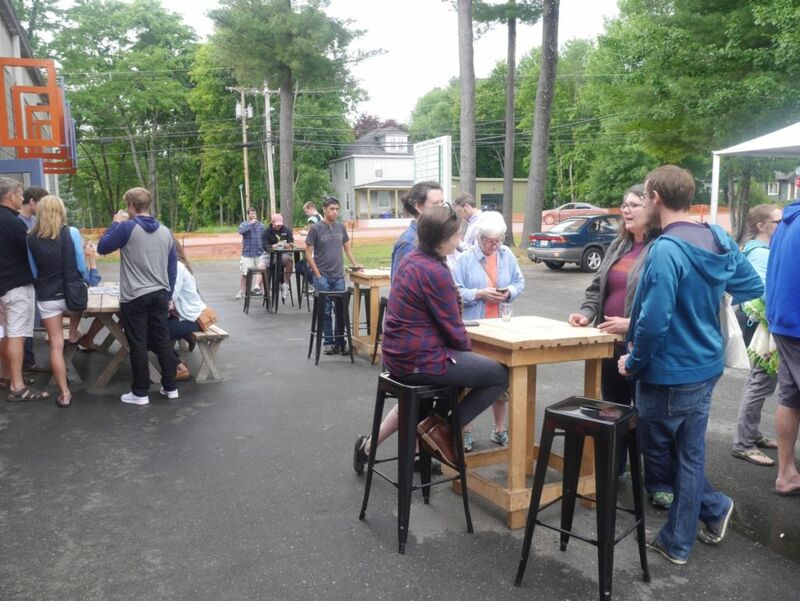 If you make a trip to visit Allagash, keep in mind that doing tours is the best way to taste the most beers. After some noisy indoor breweries, I was glad to have some outdoor seating options. Like Bissel Brothers, this is a brewrery you visit for cloudy juicy North East style IPAs. Towards the end of my time in Maine I visited Trillium and picked up some cans in Boston. It is easy to add on a visit to pick up cans at the end of a trip if you are returning your rental car at the Boston airport. The store Trillium has in Boston doesn’t get very crowded and so you can quickly buy cans and get on your way. World class breweres are understandably put on a pedistal because after a while average beer doesn’t satisfy you the same way it once did. 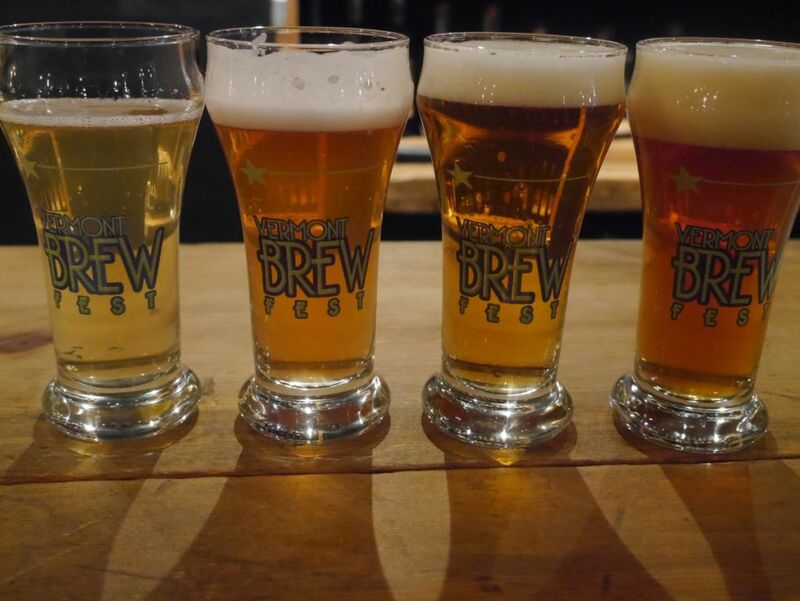 But among world class breweries some, for various reasons, don’t allow you to drink much when you visit. Some people prefer to simply show up and buy legendary cans to enjoy at home. I generally travel and visit breweries to both buy their beer and try it first while I am there. At Hill Farmstead you do not have a chance to try their saisons before buying bottles. 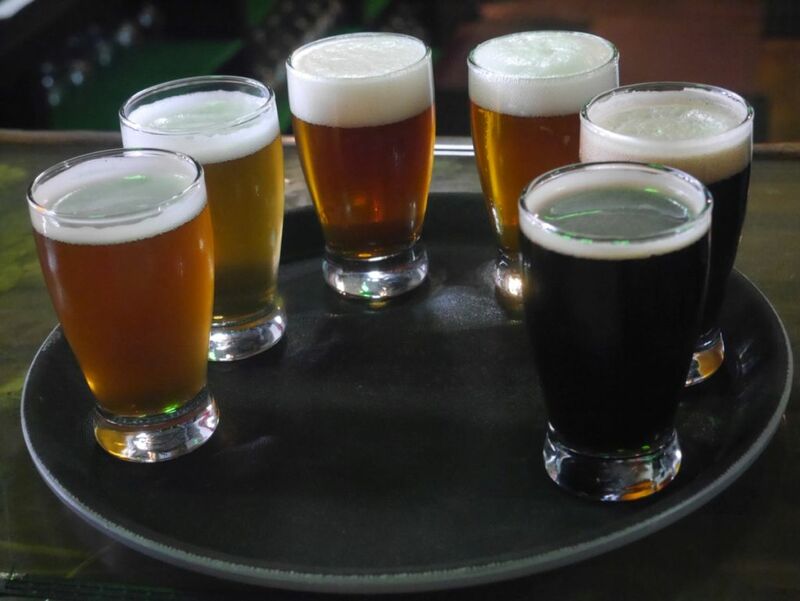 That isn’t to say that I doubt the quality of the beer but even among beers at world class breweries, individuals differ in their palate preferences. I may have chosen to buy a $30 bottle of the aged saison at Hill Farmstead for example if I had tasted it first. 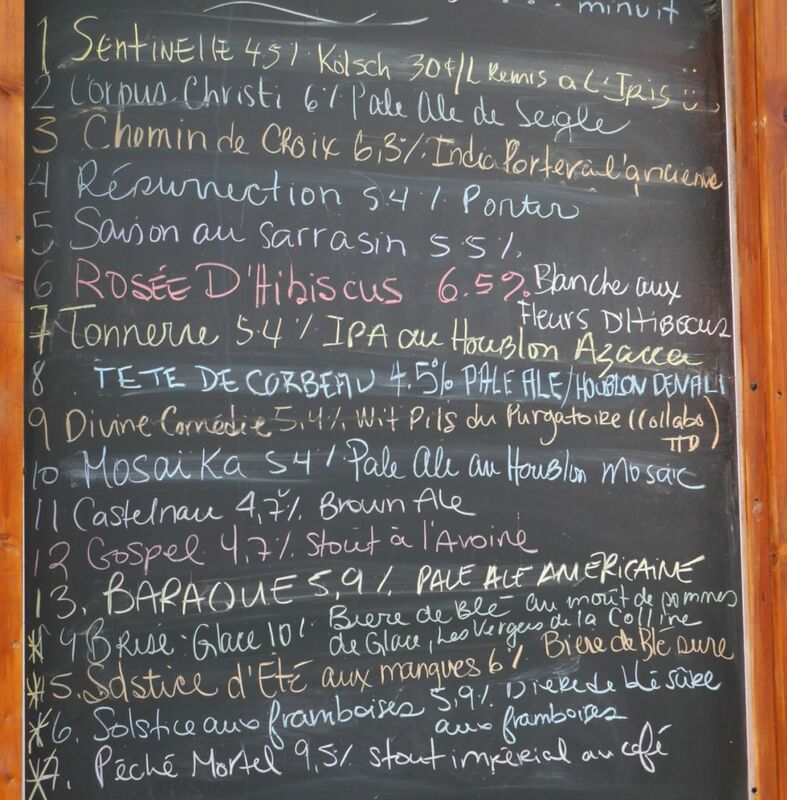 I happened to visit Hill Farmstead and The Alchemist in the same trip as I visited the world class Montreal Canada brewery Dieu du Ciel and of the two I would sooner return to Dieu du Ciel because I really enjoyed hanging out there. 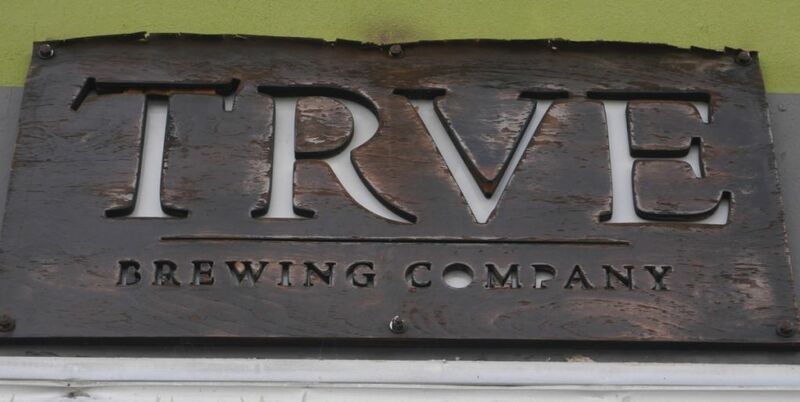 Don’t get me wrong, I am glad that I visited both of these breweries and will be enjoying the beers that I purchased from them but the experience of hanging out at a brewery and having a beer before I buy beer to go is something I generally value. 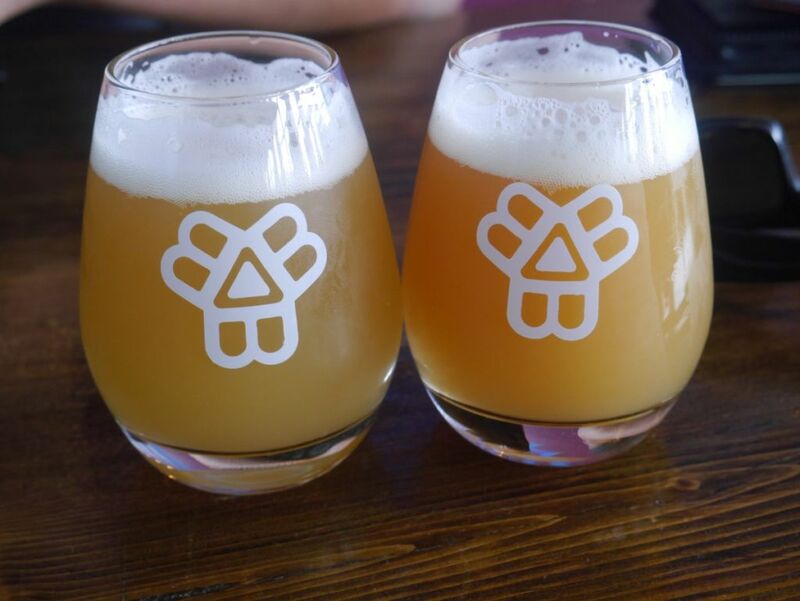 And while Trillium’s boston location has similar limitations, one could also quickly stop for beer on the way through with much more ease because they are located in central Boston. It can be hard for someone who lives in California to conceptualize just how far apart breweries in Vermont are or even just how spread out Vermont is in general. In parts of the North East United States you don’t have cities so much as you have towns. And these cities are sometimes 20 or 30 miles apart. So the drive from The Alchemist to Hill Farmstead takes 50 minutes not so much because the distance is so great but because the roads in between have such low speed limits that you can’t possibly drive that distance in what you would be used to in San Diego or Los Angeles. The closest thing to the roads in Vermont is some smaller roads in the rural outskirts of San Diego. To get out to Valley center you drive through a number of small two lane roads that by nature you can’t drive through very fast. Add to that an hour or so wait in line at The Alchemist at least when I visited and it is an experience I would prefer to not repeat again for a while despite really enjoying the beers I brought back. I was excited to visit the new brewery for The Alchemist once it opened because it is the first time that they have made available beers other than heady topper after their two years or so of brewing just the one beer. 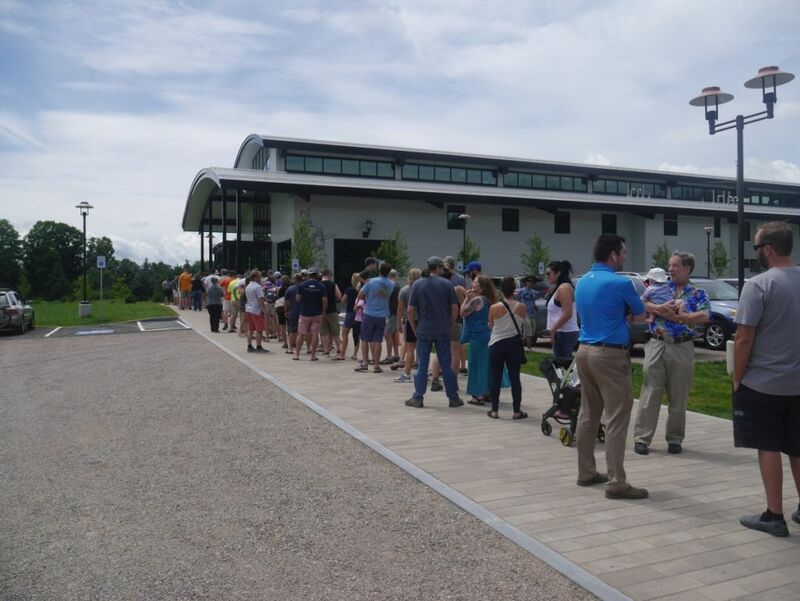 From what they indicated they have no plans to serve beer on site so if you want to buy the beers other than heady topper you must visit the brewery in Stowe and potentially wait in line for an hour for the opportunity to buy cans of their beer. The beers are fantastic. I enjoyed what I tasted. 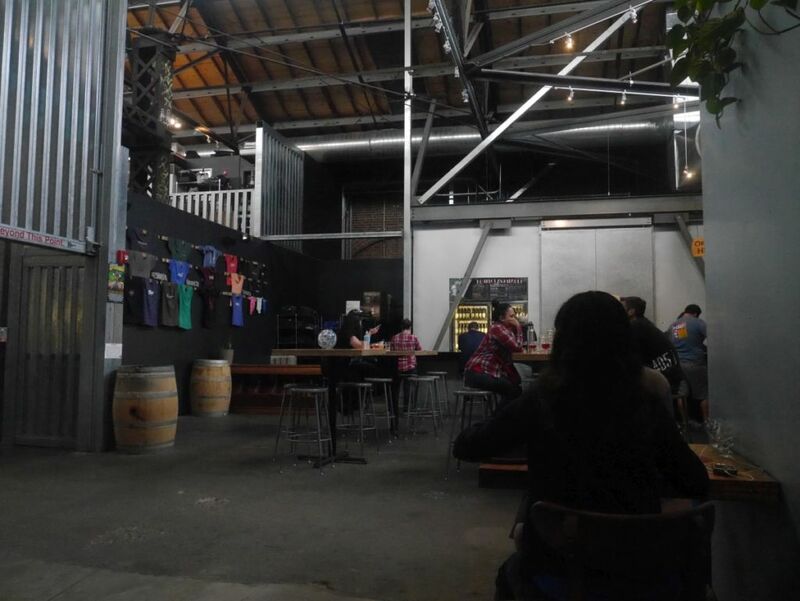 But I also value the experience of sitting around at a brewery chatting with the other people who made the same pilgrimidge and would rather not have those conversations only in line. Massive line of people waiting in the sun to buy cans. You get a few very small tastes of the beer while you are waiting in line, once they let you inside but before you get to purchase the beers. Right now they limit you to purchasing two four packs of each of the double IPAs per person per day. The amount they allow people to buy may fluctuate over time so check their web site to see what is for sale. Though I waited an hour in line it wasn’t a bad experience because I had a lot of great conversations with people I met in line. I would like it much better if they also added a room next door where you can stay and have some full size tasters and even potentially drink some beer on site and relax. Treehouse, in Massachusets, I am told has similar lines and waits for their cans and also doesn’t do tastings, if that is a consideration for you. Taps from which you get your small tasters. I wasn’t able to get any cans of Crusher, their other double IPA so I can’t comment on how it tastes. However, cans of Heady Topper and Focal Banger were all quite delicious. I prefer Focal Banger just slightly because you get to taste the English yeast a bit more prominently. 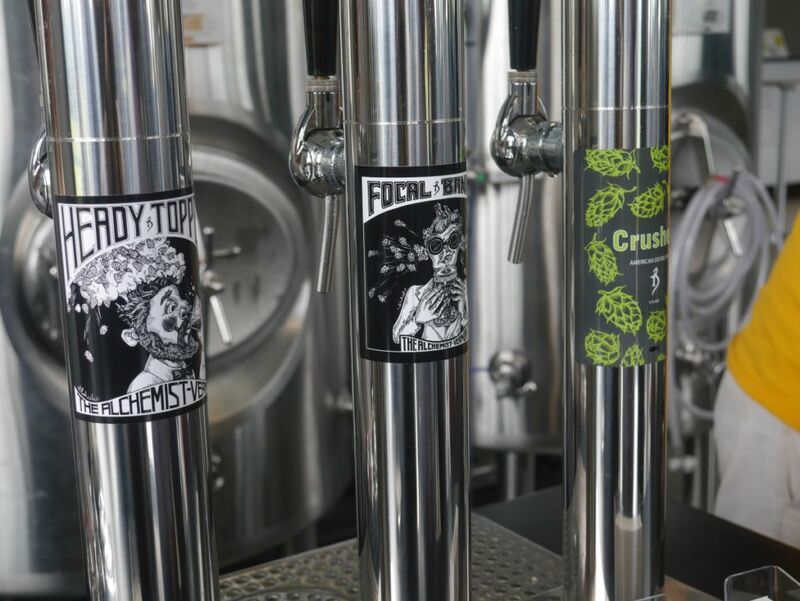 Once you notice the flavor in Focal Banger, it becomes more apparent in Heady Topper. I did some experimentation to see if the beers really did taste better straight from the can and found that the bitter hop resins that sink to the bottom are best left in the can until the very end because they can overpower the rest of the beer. As with any beer, some cans in the four packs I got were better than others. Some showcased more prominently the hop aromas and others were more heavily bitter. 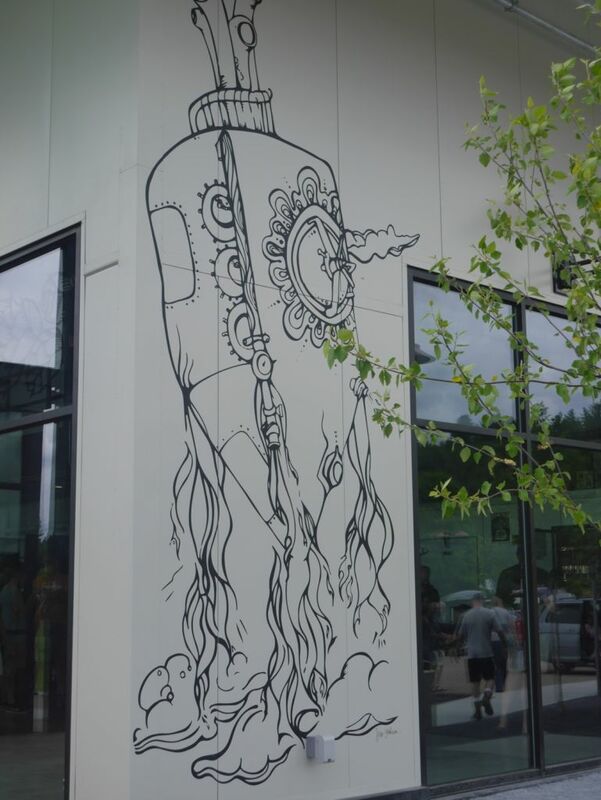 Crazy cool wall art outside. I also bought a few cans of their double wit beer while I was there and enjoyed one while I was still in Vermont. It was quite tasty and blended nicely the flavors of added spice usually found in a wit and the spice notes generally associated with Belgian yeast. At 7% alcohol, it was sweet without being cloying and is a nice alternative for someone who isn’t so much into hops. 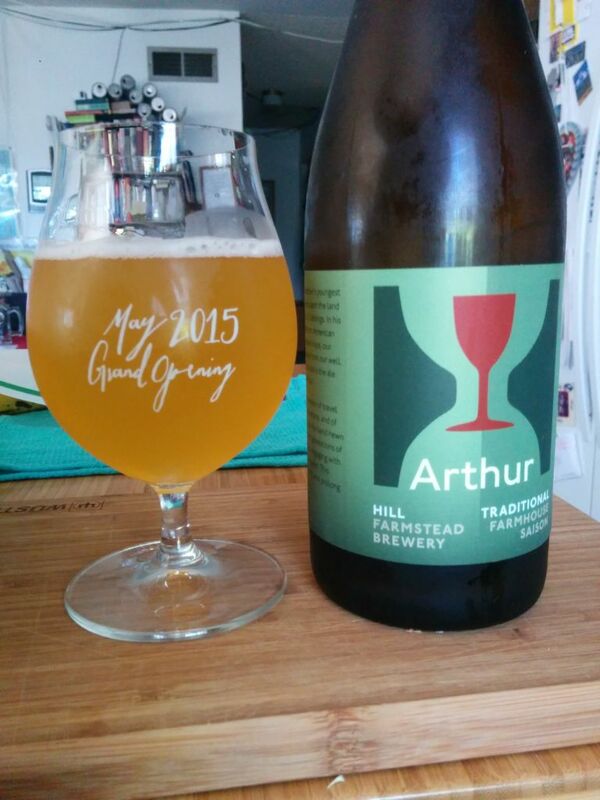 Hill Farmstead has been named the greatest brewery in the world on a number of occasions. They are a long 50 minute drive from where you can visit The Alchemist in Stowe. There is nothing else in the area and only a handfull of shops in the area sell their beers. This means people in surrounding areas must make the drive pretty regularly to refill their growlers if they want to drink Hill Farmstead IPAs. 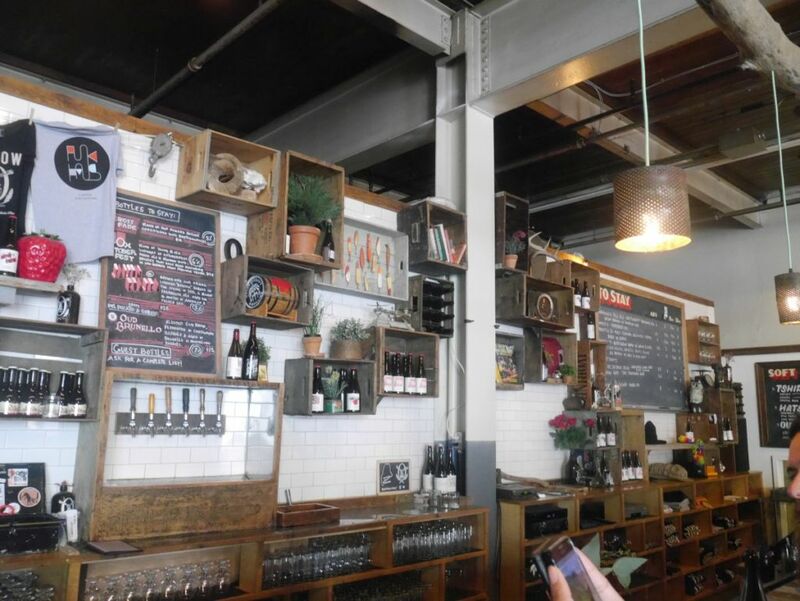 They have a small area where they serve half pours of a small number of their beers and sell bottles to take away with you, which are generally priced very reasonably, $10 for most bottles and more for barrel aged ones. They also have a main area where they fill growlers and offer half ounce tastes of the different beers on tap. Also keep in mind that though I found the experience somewhat lacking, it is still much better than it used to be before they renovated the facility. Though admittedly if I had known I would end up just buying bottles there I would have driven myself out there two years ago when I was staying in Burlington rather than skipping it because my husband was busy with other things and unable to drive me as he usually does for the safety of myself and others on the road. 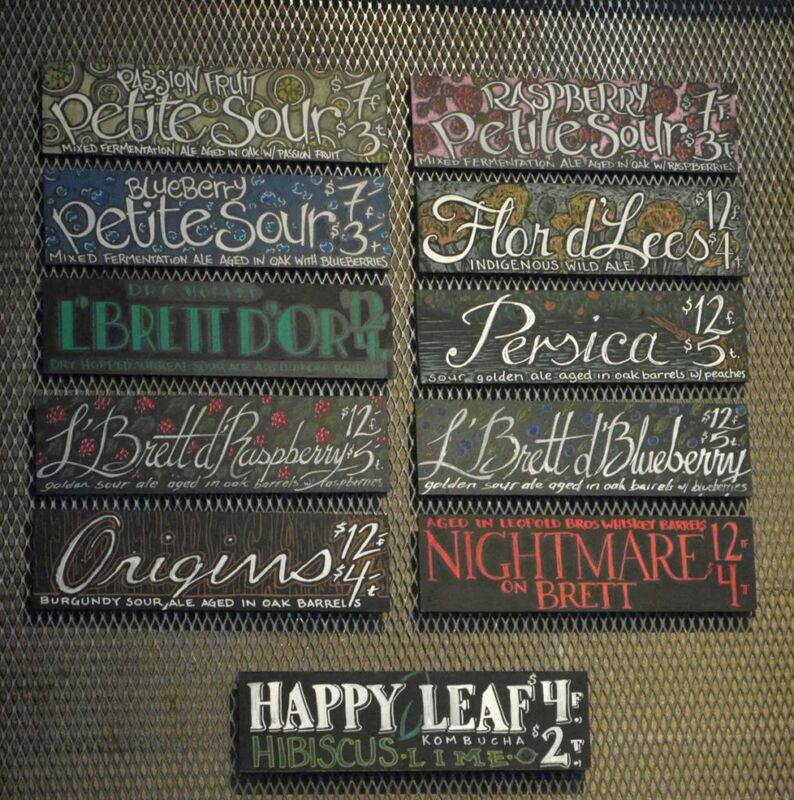 You are going to find the hop forward beers on tap and for growler fills while the farmhouse style ales are served in bottles either for on site consumption or take away. Though I could have tasted a bottle while I was there, I would have ended up sharing with strangers to avoid drinking a whole bottle myself, though it seemed most people there were stopping by for quick growler fills. Growler pricing is also reasonable with $3 for an empty 750ml growler. IPAs are served in growlers and not bottles for freshness reasons. I misread the price of empty growlers when I visited and didn’t realize that only the 2L empty growlers were $10. For the full list of growlers they fill you can read their growler policy here. 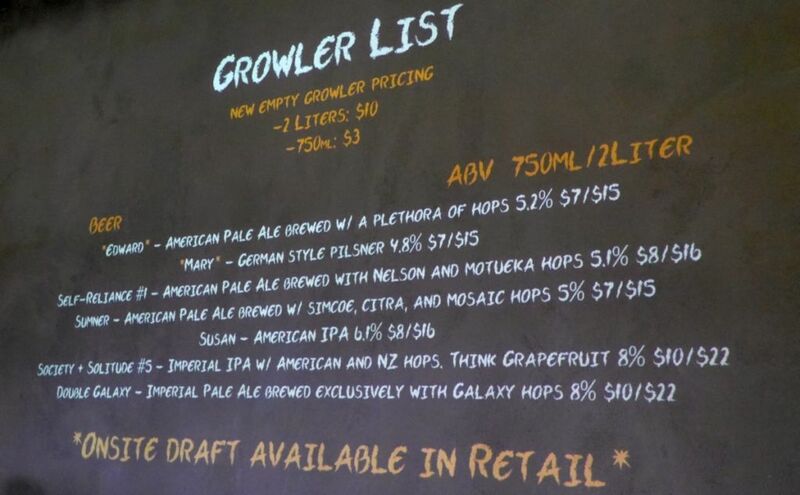 Otherwise if buying their growlers when you visit (much easier if you are flying in rather than driving) you can expect to pay a total price of $13 for 750ml of double IPA (factoring in the empty growler). I could tell many locals were coming by with multiple empty growlers to re-fill so they must love those hoppy beers. Enjoying a bottle of Arthur at home. I left the brewery with four bottles of their farmhouse ales and am quite looking forward to trying them but I did not buy the double IPA growlers I had considered buying because I misread the prices they charge for an empty growler. I didn’t find the hoppy beers that I sampled while I was there to be drastically different from anything else I have ever tasted in the same style. If anything the lighter hoppy pales were a bit light on the hops for my tastes. 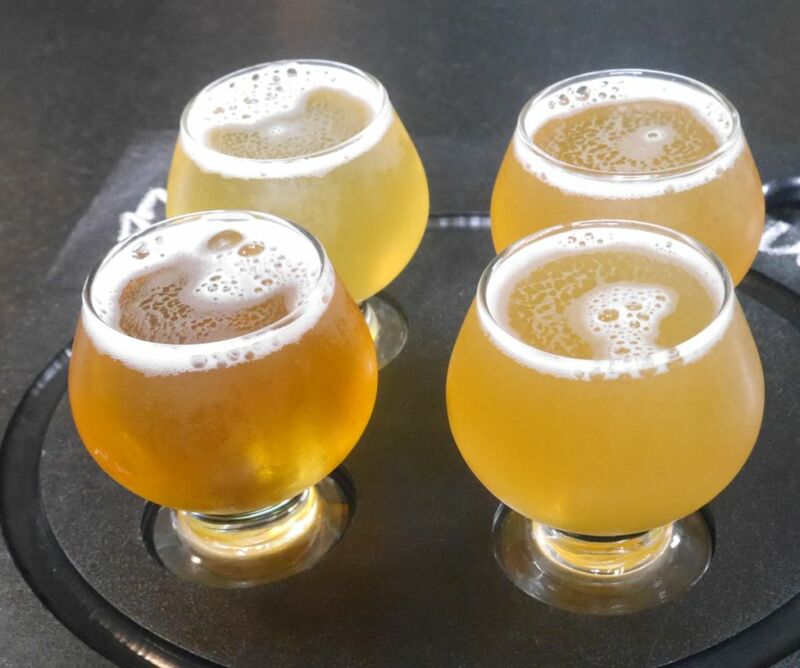 Considering that your only option for buying their beer is to drive out into the middle of no where in Vermont you are better off connecting with friends who can give you tastes of their beers. You may find some of the farmhouse ales at certain restaurants in the area but if you want a growler of IPA you have to go to the source. I have been quite impressed by the quality of the farmhouse ales I brought back with me after opening them and they were absolutely worth the cost for bottles. 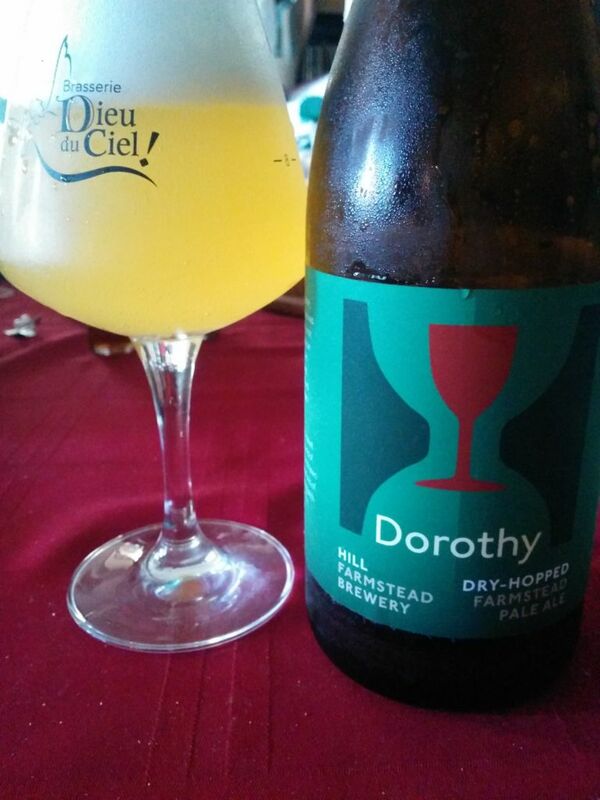 Enjoying a bottle of Dorothy at home. If you do take the trip out to the brewery despite everything mentioned above I have a few suggestions for you. Take advantage of the area you are driving through and do some hiking or grab some local cheese and farm fresh vegetables around the area and enjoy the experience. We picked up a loaf of bread nearby, some local soft cheese, and some current jelly that we enjoyed really nicely together. Also consider borrowing a growler from a friend if you know someone who has made the trip and takes proper care of their growlers. In that case, the prices for the hoppy beers are quite reasonable. If you are there for farmhouse ales, consider buying in bulk if you have the space and interest in cellaring them. 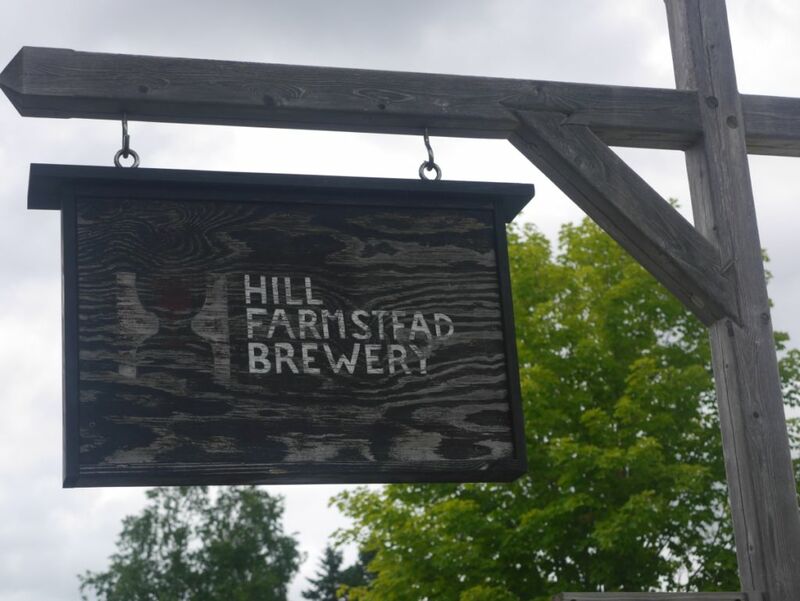 9-11-16 – This post has been updated to correct an earlier version of the post which inaccurately indicated that empty 750ml growlers are $10 at Hill Farmstead. The post now correctly indicates that empty 750ml growlers are $3 and empty 2L growlers are $10. 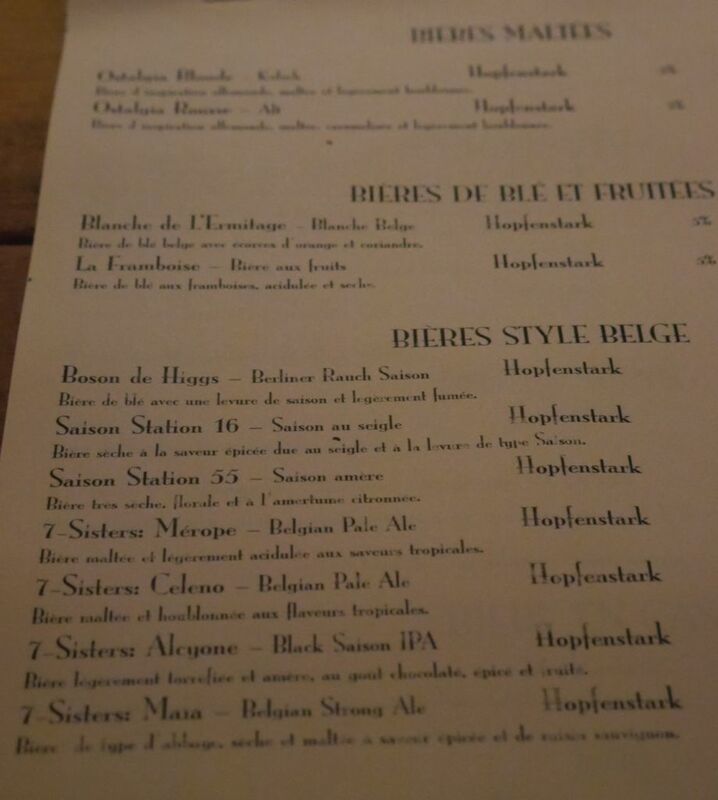 While in Montreal I visited two breweries, Dieu du Ciel, and Station HoSt where they serve beers from Hopfenstark brewery. I really enjoyed the overall atmosphere at Dieu du Ciel and how they served flights and full pours of their beers plus light food. It was a little strange that you couldn’t buy their bottles at the brewery but had to visit nearby bottle shops but we managed to find a place to buy some bottles of Peche Mortel. I tried quite a number of beers and ultimately went for more Peche when I was finished with the tasters, though this didn’t make the experience any less awesome. I left with one of their fantastic glasses that will be fun to use regularly. 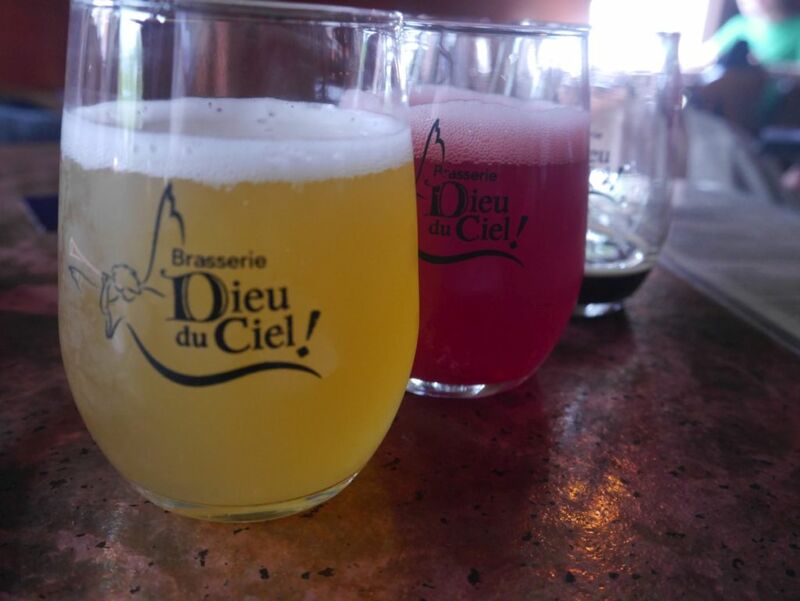 In total I tasted 5 beers at Dieu du Ciel and my husband tried 3, which I sampled as well. All of the beers were quite impressive but a few stood out among he bunch. They didn’t have any IPAs in the traditional sense but the various hoppy beers were delicious and were more than enough to satisfy my hop addiction. I started with a rye pale which became even more impressive once I translated the beer name and realized it was rye I was tasting. The beer did a great job of highlighting the spice from the rye while keeping the overall beer silky smooth and mildly bitter. This is a beer where the malts shine. The mosaic pale was delightful as well with the malts staying mostly in the background and letting the juicy fruity flavors of the mosaic hops shine as good as I have tasted them anywhere else. The saison I tasted was a fantastic mix of citrus and spice on the nose. The beer has a chewy mouthfeel and has earthy malt notes along with some peach notes and a dry finish. It is quite the impressive saison. The porter was really smooth with hints of roast and caramel, subtle yet very well done. The oatmeal stout, which appeared to be on nitro, was silky smooth with mellow smoke and bitter chocolate. 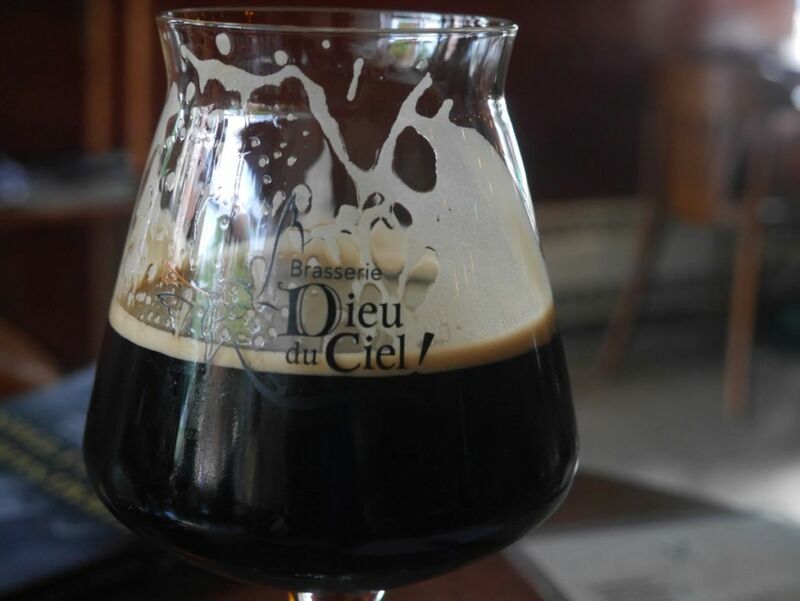 The Peche Mortel is one of the most popular beers Dieu du Ciel brews and when I tasted it I could immediately tell why. I have tasted quite a lot of coffee imperial stouts in the past and this one is up there with the best of them and I would even say I prefer it over Sump from Perennial. It is luscious and creamy thanks to being poured on nitro and has tons of coffee and caramel with a perfect balance. This was the beer I stayed and sipped on after all the other tasters and the one I decided to bring back with us to the US though hopefully my husband doesn’t drink it all without me. Before leaving I tasted two sours and they are some of the least acidic sours I have ever tasted. The mango sour was almost like drinking mango juice, with very low acidity and some mild sweetness. The framboise was also super smooth and jammy with some hints of hibiscus and mild sweetness. These two have also been the only sours so far my husband enjoyed. They are so unique that I would consider another trip to Montreal to buy them if they happen to be available in bottles in the future. 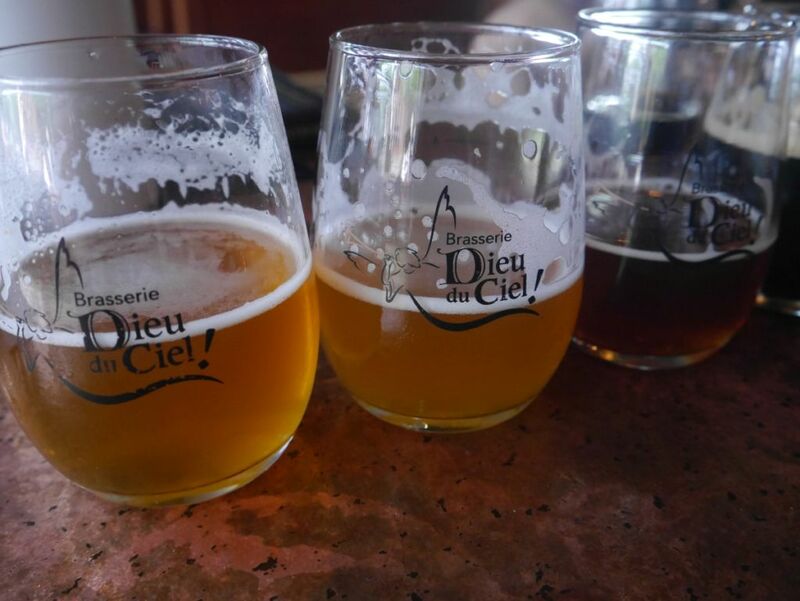 Dieu du Ciel has not only some of the best beers of any brewery I have visited but also one of the best experiences and most relaxig tasting rooms of any brewery I have visited. They serve food as well though I didn’t partake. 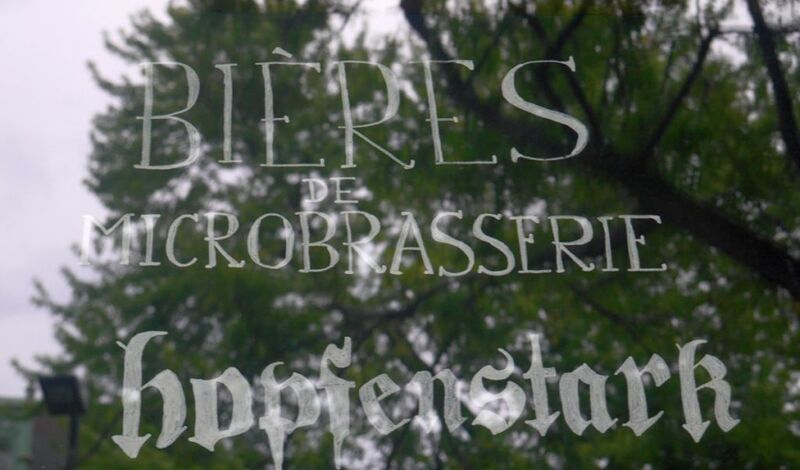 Station HoSt is a bar that serves exclusively beers from a brewery called Hopfenstark. 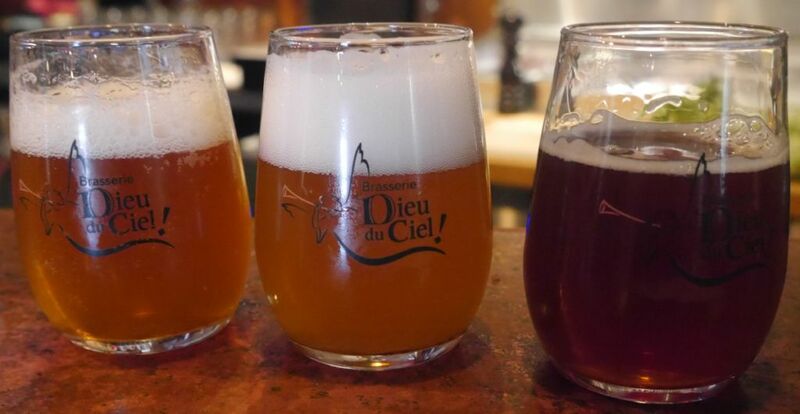 I admittedly raised the bar ridiculously high by visiting this brewery after Dieu du Ciel but I was not impressed by the beers I tried and would recommend you skip this bar if you are in the area. I only tried a few tasters to start mostly so that I could leave quickly if I didn’t like what I had without drinking a ton. Part of this had to do with he noisy bar atmosphere they have, which wasnt exactly inviting me to tay very long. I started with the framboise which I found quite sweet and reminiscent of cough syrup but also quite acidic. I could understand if it ended up simply being too acidic for me but it happened to be too medicinal as well. The rye saison was pretty solid and quite malty but also a bit boozy and reminiscent of pumpkin pie spice. Also quite unbalanced. The gose wasn’t bad but also seemed a bit lacking in flavor in general. It was mildly tart with hints of fresh apple. 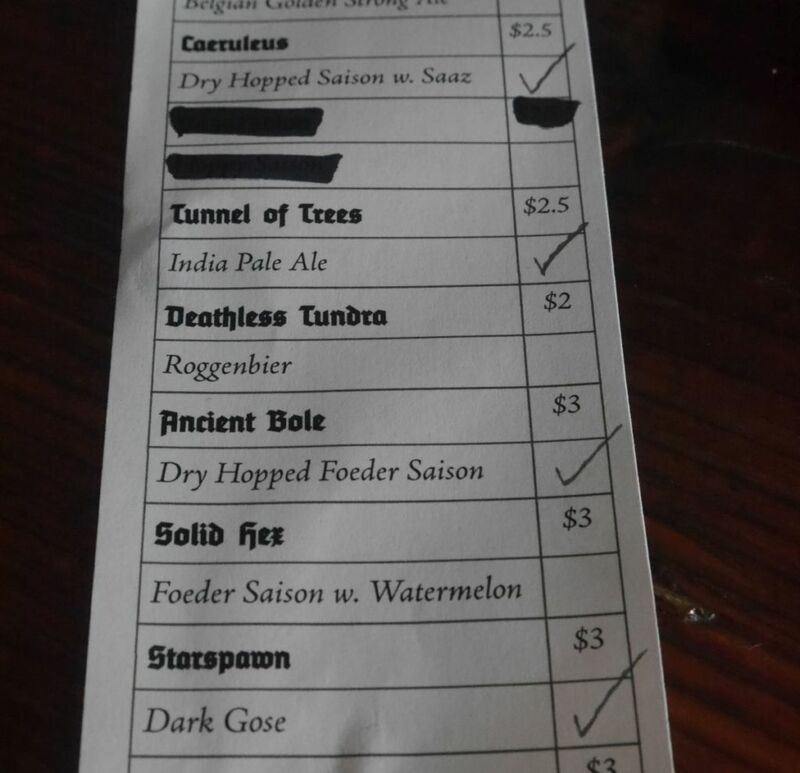 I was about to leave but the bartender who may have been the owner offered me a taste of the imperial stout, which wasn’t available in tasters and only in a full 8 ounce pour. This was the best beer of the bunch and was a good mix of caramel and coffee while being sticky and thick, quite a tasty imperial stout. I would recommend only stopping by the brewery if you like a good imperial stout because their other beers need a little work. Even then their imperial stout didn’t come close to Peche Mortel from Dieu du Ciel. I had also considered visiting a few other breweries in the area as well but when we went to the bottle shop to buy some Peche Mortel to bring back with us, I found some other beers that I ended up drinking on my last night instead of going out to another brewery. If you do happen to visit, consider visiting Benelux, another brewery, or if you prefer bars, Vices et Versa or Le Cheval Blanc. All came highly recommended.